This plug-in backups email messages from web services over the IMAP protocol. Many Web mail servers require an additional permission for using a local client (which Handy Backup is in this context). To give this permission, you can open your email account in a browser and click a button or mark a checkbox in account settings to give this permission. Create a new Handy Backup task. Select a backup task on the Step 1. On the Step 2, select the "Email" plug-in from "Email" group. In the appearing dialog window, create an email access configuration. Give your configuration some name, typing it in the "Configuration" string at the top. 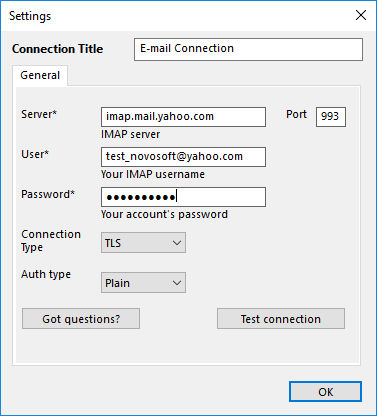 In the "IMAP Server" string, enter a particular IMAP configuration for your server. Here the (yourservername) is a substitution for your webmail server address, without parenthesis or any prefixes over the "imap". Enter the port number (the default port for encrypted IMAP is 993, for unencrypted IMAP is 143). Provide your username and password for an email account onto the appropriate fields. Note: The server can either require a short username (only a name before "@") or a full name with a server name after "@". For details about server name, please refer to a setup manual for a particular server settings. Select the connection type according to your particular server requirements: TLS, StartTLS or other. Select an authorization type (you can learn what to use from a server settings or via the Internet). The default type is "Plain". Now you can either test your connection, open this page from the program, or just click OK and return to the plug-in window. You will see the plug-in window with email folders in an account you entered. Check/uncheck the boxes against the particular data you will plan to back up/exclude. Click OK button to return to the Step 2. Now you may add another data to a task; then proceed to next steps. 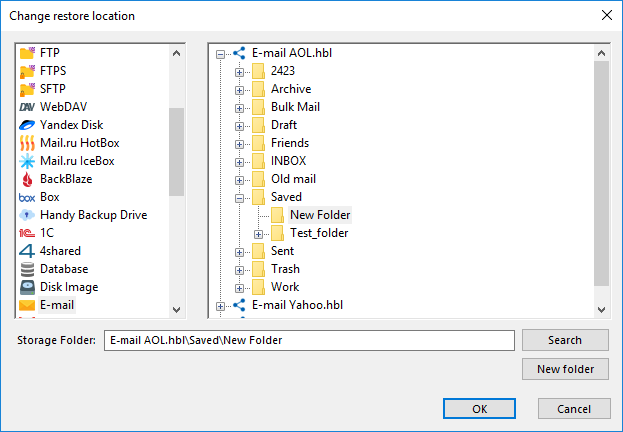 All next steps are unspecific to webmail backup. Read the User Manual for detailing these steps. The Email plug-in also allows automatic restoration. To do it, create a restoration task on the Step 1 of the new task wizard. 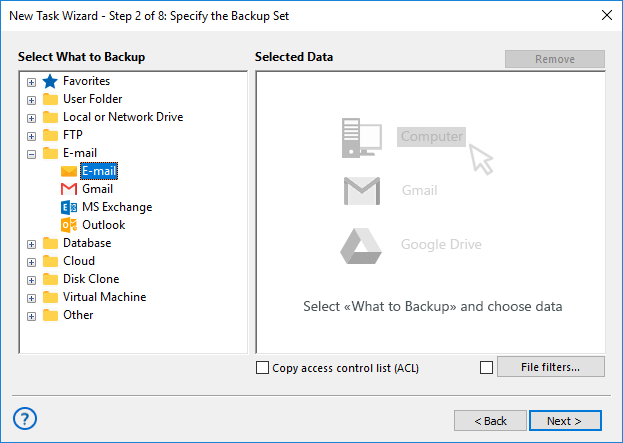 Then select a backup vault on the Step 2 and find the file backup.hbi, which contains all the data about restoring email messages. Sometimes, you may have a need to restore some or all of your messages to a different mailbox, or even to a different webmail server than an original copy backup. 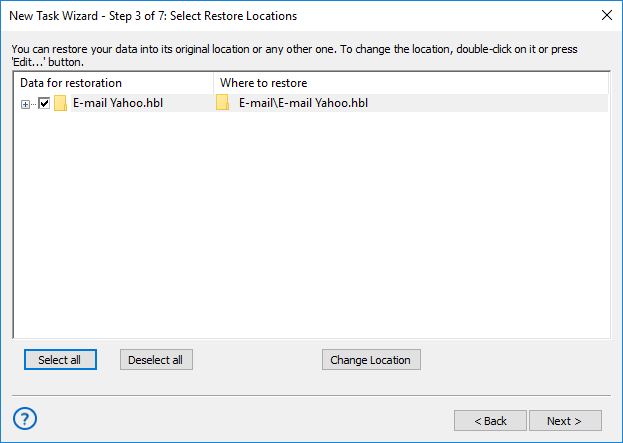 For these cases, click on the "Change restore location..." button in the restoration dialog when creating a new task, and select a new destination. After selecting this option, you will see a data locations window. Select the "Email" plug-in, and then choose a new server to restore your data. We are strongly recommending saving the information moved to another server in a new folder – click the "Create folder" to do it! The Email plug-in uses the IMAP protocol for data connection. 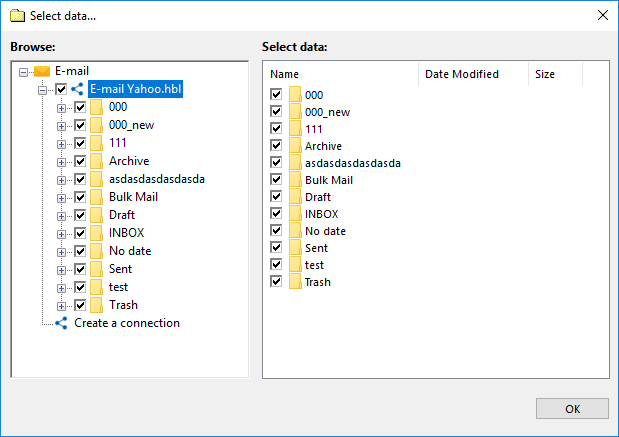 Almost all modern webmail services, including Gmail, Yahoo! and Outlook mail, support IMAP. This protocol allows both backup and restoration of email bases. Handy Backup stores email copies in the dedicated EML file format, supported by many email local clients. Therefore, you can read, modify, sort or change the backups, assuming these backups are uncompressed and/or unencrypted. You can even restore EML just by moving it with a file manager!